Although I hiked from Georgia to Maine, I never made it to Mount Katahdin. I left the trail. I quit. I walked out of Gorham, NH, under a light rain. I took a day off to recover from the Whites. Then I loitered around for another half day hoping that something would get better. It never did. I just wanted to sit, to lie down and not move. But I’d felt this way before. I thought that a little walking under the weight of the pack would catapult me from my lethargy. That evening I hiked to Gentian Pond Shelter, a few miles shy of the Maine border. The shelter was in a beautiful area with an expansive view beside a gorgeous pond. I did my chores and watched the clouds gather in the valley. In the morning I sat for hours looking out into the heavy rain, not knowing how I was going to pull through another day. Waiting out the rain in Gentian Pond Shelter. I eventually left the shelter in the rain. The last climb in New Hampshire was over Mount Success. In typical fashion the trail was straight up granite slabs that turned into cascading brooks under the rain. I slipped on the rocks, with water running into my shoes, desperately hanging onto the weakest looking shrubs for support. Three miles from the shelter I crossed the peak. Worn out, alone, wet, and confused, I sat down on a rock. I was overcome with memories of all those decisions that led me to the AT. Like many on the trail, life before wasn’t particularity rosy. I got a little emotional. Smiles masking the deep feeling of emptiness. Maine border. I crossed that state line, the 14th of 14. With 280 miles to the end I felt empty, like the task ahead remained in the realm of impossibility. 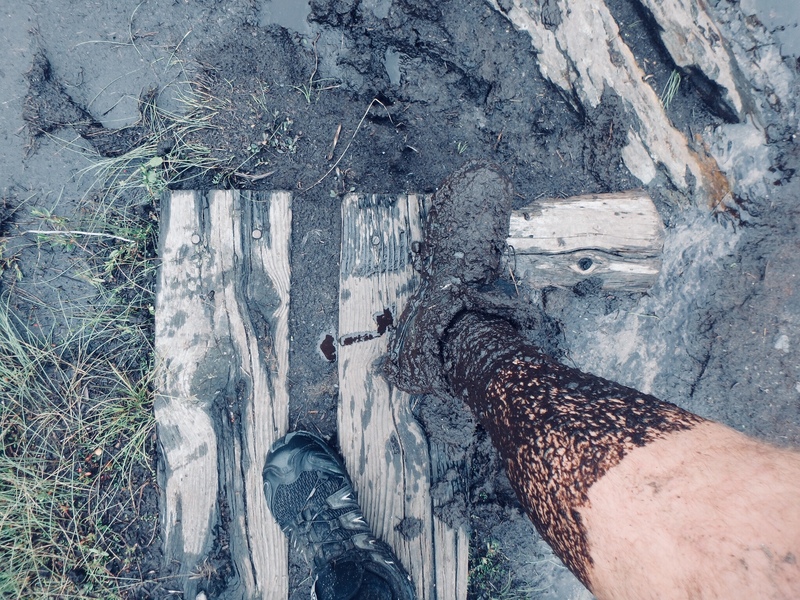 I crossed the Goose Eye Peaks, balancing on the floating planks and sinking up to my knees in mud. Eventually I made it to Full Goose Shelter, where a few hikers were hanging out trying to trap a mouse. That evening I had some stomach discomfort but thought it the result of too many TV dinners at the hostel. Boot sucking mud in the alpine bog zone. While at the shelter I teamed up with another hiker to pass through Mahoosuc Notch. Lest one of us were to fall into a crevice, we thought it safer to go together. The Notch is basically a mile and half boulder scramble. Some say it’s the hardest mile, some say it’s the most fun. I thought it was just plain stupid. We did have a good laugh together, particularly as I got stuck in a hole as she tried to push me through. Unbeknownst to her she pinned me harder against a rock on the side I tried to exit. I shouted at her to stop, with my face smashed against the cold rocks. Following the Notch the AT goes up the Arm, another senselessly punishing climb. Throughout the day we talked about resupply points. We debated the pros and cons of Bethel versus Andover, accessibility, food options, ease of getting a hitch, and so on. I suggested we try for Bethel that evening and let luck decide what our choice to be. At Grafton Notch we were able to score a ride to town from a couple heading home from a day hike. We ate barbecue from a food truck, resupplied from a Circle K and a health food store. Surprisingly, we got permission from the health food store to camp on their lawn, and then unsurprisingly got our permission revoked a few hours later. Near dusk we walked toward the river and found a place to camp in the vicinity of a campground. Then all hell broke loose for me. My gut was feeling bubbly that day but only slightly out of the ordinary. As many hikers know, one’s stomach can unleash a reign of terror on the regular. After a few weeks on trail, what the body expels is far from normal. This was different. This was concerning. I woke in the middle of the night and walked back and forth to the toilet at least three times. Every time I lay down I felt another wave come over me. I hardly slept at all that night. I knew that I might be seriously sick. 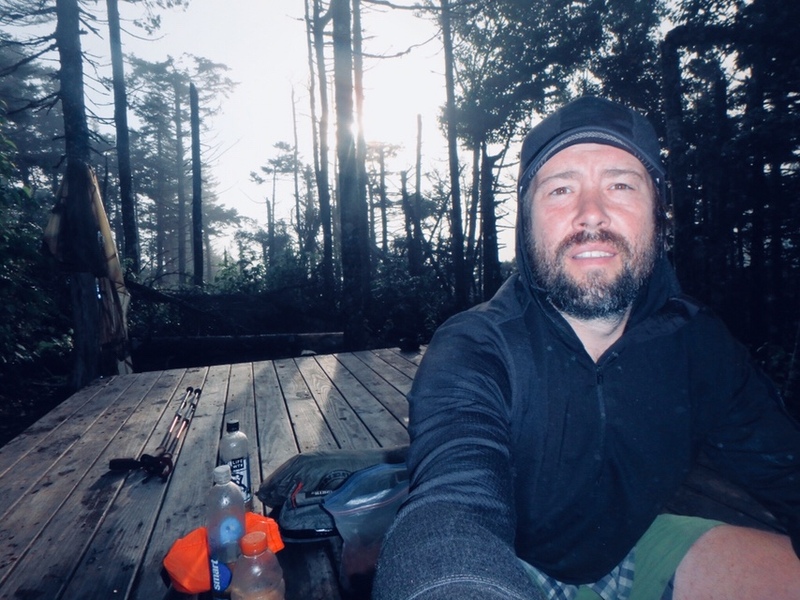 To my amazement, my restless night, the zipping and unzipping of my tent, the hurried footsteps to the toilet, my hiking partner didn’t hear a thing. I was up all night turning my insides out and she slept soundlessly and peacefully. I described what I was feeling and she related her own experience with cryptosporidium. This had been on my mind, and I feared for the worst. I was often chastised by others for drinking untreated water. I would joke that my goal was to get a stomach virus so I’d have an excuse to go home. Between the overrun trails in the White Mountains, the huts, and the heavy rains, these provided a perfect opportunity to contract something. And I was growing ever more careless with my water. We went back to Circle K for some anti-diarrhea tabs and found a hitch back to the trail. It wasn’t long before I was back to walking that I was pooping my insides out again. My appetite was nonexistent, and anytime I drank any water I was running into the bushes to try to dig an emergency cathole. Things were not going well. I stopped at the Frye Notch Lean-to, a scant six miles from Grafton Notch where I started that day. My symptoms were only getting worse. I decided to push on to the next road to catch a shuttle into Andover. There, I could hole up in a hostel and evaluate how I was doing. Moments after the realization that this trip is probably over. I took the rest of the day off and then took a zero with no improvement. Laid up and exhausted, I hadn’t eaten. Anything liquid just seemed to pass through. I was in bad shape. On the third day I thought I’d try a slackpack of ten miles, but when the shuttle was set to depart I couldn’t get any farther than arms reach from a toilet. I had a few conversations with hikers at the hostel about my condition and what they thought I should do. Everyone was willing to hear me out. No one wanted to give me any sort of advice. As everyone has their motivations for being out there, everyone understands that you can’t make anyone do what they didn’t want to do. I had to hike my own hike. While resting throughout the midday I felt OK. I sat wondering during daylight hours if I could, if I should, kit up and head back into the woods. Then the evening through midmorning was punctuated with unpredictable spasmodic and explosive bowel movements. I’d wake up in the middle of the night multiple times and lie in bed wondering if I could sleep with the bloated knot in my gut. Hiking my own began to look like not hiking. I started looking at ways to get home. Altogether I hiked 1,934 of the 2,191 miles of the AT, about 88 percent. I find this appropriate, as a roughly B+ average is consistent with the amount of effort I put in during both my undergraduate and graduate studies. I stood looking at the relief map on the wall. This strange shape that was Maine showed me the absurdity of quitting and the senselessness of continuing on. Likely, I had a brush with crypto and it was impossible to know exactly how I would feel tomorrow, or in a week. I hesitated marching headlong into more remote sections of Maine’s interior. I had been in the thick pressure of summit fever, of finishing the trail no matter what. Despite everything else I’d experienced during these past five months, I was able to stuff those hardships away and walk on. But I found it’s hard to maintain an attitude of mind over matter when the intestines are in revolt. My mental and emotional reserve had long been depleted. I first recognized the senselessness of this trip for me as early as the Roan Highlands, leaving North Carolina. Upon entering Damascus, I started to seriously look for work in the coming fall. I realized at once that this couldn’t last forever, and I didn’t want it to. The thoughts of quitting settled over me the worst near Port Clinton, PA, and hardly let up until the end of the heat wave in Massachusetts. I’d reluctantly pack up my things, eat a little, and walk on trying to immerse myself in the environment. This lasted about 15 minutes and I’d put in my earbuds to listen to music to drown out the monotony, boredom, and encroaching misery. I would do all I could to separate my mind from my body just to mash miles all day long. While I don’t drink or use drugs, it was painfully clear why some hikers were stoned all day and would then drink themselves into oblivion upon reaching town. What started as a vacation turned into a calling, this morphed into a full-time job, a chore, a burden. In the end not only did I not think I was well enough to go into the woods, I frankly didn’t want to. I fought against this trail for months, and if my way of getting right with the trail is to go home then that’s what I need to do. It took about ten days from Full Goose Shelter for my gut to return to normal. I’m back home in Central Arizona and I’m happy to be off trail. Had I stuck it out on trail my projected finish date would brush uncomfortably close to the day I need to start work. I now recognize how tired, anxious, mentally, and emotionally strained I was in the end. The thoughts of hiking another two or three weeks is incomprehensible and undesirable. I had long since hiked the fun out of the hike. It was important for me to discover some of my limits, to see the trail for myself, to learn what I like and what I don’t like in a backpacking trip. While I may never be a thru-hiker on a long trail, I maintain the utmost respect for those who are. I realize that the physical trials, reaching my emotional breaking point, the mental somersaults may have had a sense of purpose in the end. Perhaps the sign atop Katahdin possesses a power of the occult that transform suffering into meaning, that the sign is really a door into something I will never know. See you on the next three-day weekend, woods. People, it’s not all waterfalls & butterflies. In fact it is brutally hard. Not many want to hear that or write about it. Good job keeping it real Ryne. Good post and sorry you ended up with Crypto. You put into words all that I experienced and came to realize after 2 weeks at my second attempt of the AT. I however am a bit older than you and didn’t have the energy to push on once I realized I was not having fun. It really is a job and it is monotonous. The weather is unforgiving and Murphy’s Law is all powerful. You certainly got farther than I did and you gave it your all. Good post. Sounds like you made the right decision. Congrats – 88% is still an awesome achievement! Hey, thank you for spilling your guts (sorry, bad use of words) – seriously, though, interested hikers who long to hike the AT need to see & hear from all walks and experiences. I can always learn from those who persevered and were honest in their assessment. You are not a ‘quitter’ or someone who stopped hiking the AT – you are on a journey and still walking through life. Good on you. It just goes to show you never, ever, ever drink unfiltered water especially in today’s environment. I can’t for the life of me figure why anybody would chance drinking unfiltered untreated water! The old saying is “YOU SNOOZE, YOU LOSE!” Inigine for a minute if you had followed common wisdom on drinking water? You might be finishing the hike! Sorry you got sick! Good job on what you did accomplish. You’re not alone in feeling this way. The first month of my SOBO hike was filled with sad nobos. One of the great challenges of a thru hike is learning how to keep yourself happy and healthy through the difficult times. 80% stubbornness and 20% remembering to have fun. My son and I Thru-hiked last year. It was tough. Getting to Maine and having several hundred miles to go was a gut punch. We mustered through and on our Katahdin summit day were caught in the most severe electrical storm we had ever experienced (after a Thru-hike wrought with electrical storms). We were a half mile from the Katahdin sign when we turned back. We figured, “big deal” it’s just a picture – just a sign. We returned to Katahdin this summer to summit and snap our pic. I was surprised at how emotional I was and how majestic that spot truly is. It IS transformative. I don’t fault you for leaving the trail, but I do encourage you to return. And buy a filter, that’s just dumb. What a bummer. I hate hearing about a thru-hike ending this way. I’m sorry to hear you got sick and felt such despair during so much of your hike. If I’m honest with myself, there are many reasons I’m satisfied with being a section hiker. 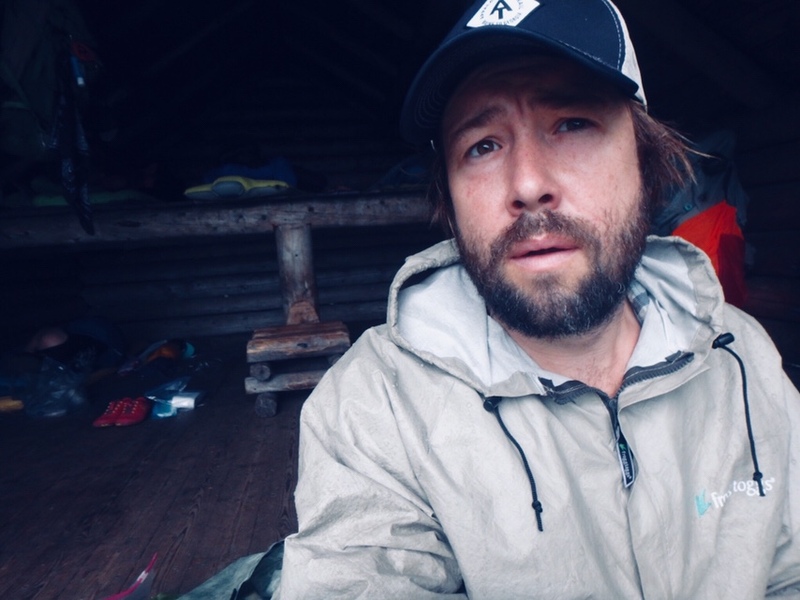 Thru-hiking sounds like such a dream, but deep down… I know it’s not for me. I’ve knocked off about a quarter of the AT in week-long and weekend sections. Since I’m out there for short periods of time, it’s always new – it’s always beautiful – it’s always a fun adventure – and then I’m quickly back home with all my creature comforts and routines. 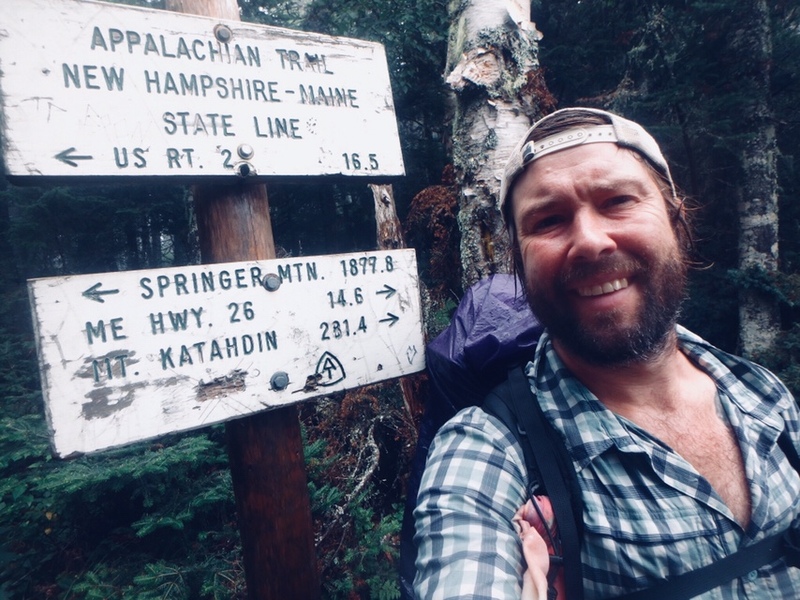 I think if I tried to be a thru-hiker, I’d have very much the same outcome as you. Thanks for sharing. You didn’t “quit”. Instead, you got off the trail after giving it a chance. I’m sorry that it didn’t work out for you. That being said, I hope you are able to celebrate the amazing amount of the trail that you were able to cover. It’s not easy, nor is it supposed to be. Good luck to you on your future endeavors.